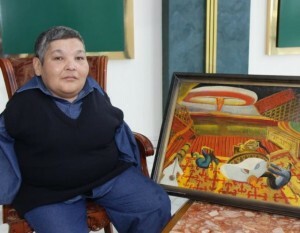 Karipbek Kuyukov was born without arms as a result of nuclear radiation exposure. He has devoted his life and art to making sure that no one – and nowhere – else suffers the devastating effects of nuclear weapons testing. Forty-five years ago, Karipbek was born in a small village, just miles from where the Soviet Union conducted more than 450 nuclear weapons tests. Those tests exposed his parents to radiation and resulted in Karipbek being born without arms. Karipbek has overcome many obstacles to become an anti-nuclear weapons activist and renowned artist, whose works have been shown around the world. Today, Karipbek often paints portraits of the victims of nuclear testing and, as honorary Ambassador to The ATOM Project, speaks out against nuclear weapons at conferences and events held in such places as the United Nations and the United States Congress. Karipbek offered a glimpse into his own struggles and motivation when he addressed the August 29 international conference “From a Nuclear Test Ban to a Nuclear-weapons-free world” in Astana, Kazakhstan.